I have just ordered more packs of these Gompels Adult Large Extra nappies as I found them to be ideal for my daytime needs when remaining fairly local. They hold up very well all round, excellent fit, four strong tapes even if a little small and plastic backing, which I find more secure than the cloth texture ones. Their capacity is fairly good and not too noticeable under clothing as they are also fairly quiet when worn. These are the best product I think on the market and as someone who has a lifelong condition and always worn nappies then I buy these regularly from Gompels. I did recently say to the sales team that it is the style, comfort, shape and the tape system that tick all the boxes on this product, also while very durable they are not as noticeable from behind in bulk like some nappies are. So for the price and the comfort factor is why I recommend this product so highly. Are these pe backed or cloth like backed? This product has a PE (plastic) backing. 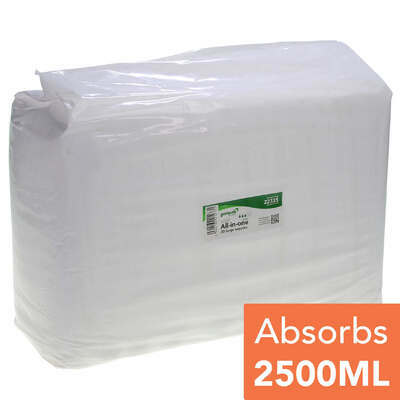 Our All-in-One Adult Diapers also come in a Medium size.